The Enduro Engineering brake pedal tip has been designed to be stronger than stock. Also offer maximum grip with the aggressive tread. Made in the USA out high grade stainless steel. 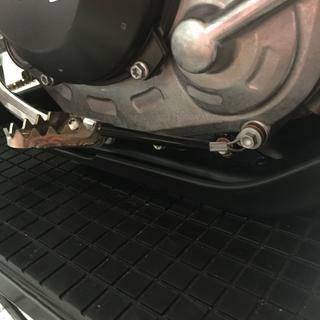 Stock KTM brake pedal tip is a little small, I would miss it fairly frequently. This EE tip is bigger and I have had zero issues with missing the pedal which has really helped my riding. This tip is wider than the stock tip, more grip, and stronger than the stock one. KTMs pedal is smaller and my foot some times missed or slipped off the petal. Which can be a Big deal coming in to a corner at a fast speed. This pedal is a little larger and I never miss it. Tip is wider than stock and the teeth are much sharper for good grip. It will bend but not break unlike the stick unit. Bigger than stock in width and length. Double drilled so you can adjust it back or forward a bit. Nice addition if your having trouble missing the brake. Best mod I've put on the bike. Gonna put this on my Honda next. 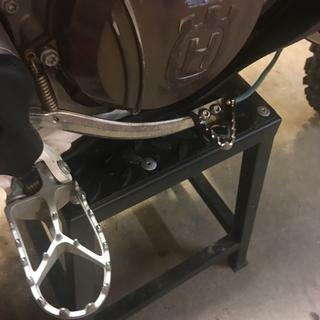 This attachment helps with actually getting your foot on to the rear brake pedal. We have all gone to use the rear brake and missed the pedal before. 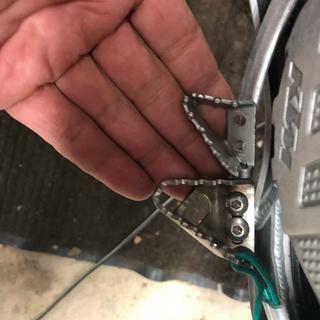 This will lessen those experiences by providing a larger contact patch for your boot to grab. The brake pedal tip has two points of adjustment. I set mine closer to my foot. It is now closer to the front ball of my foot instead of my toes. Worked great on the KTM 150. Wish EE made one to fit a Beta? Not as large as described. After having some initial difficulty "finding" the rear brake lever, I did some research for larger options. Enduro Engineering's tech support said that this lever was 1/2" wider than stock, so I ordered it here. 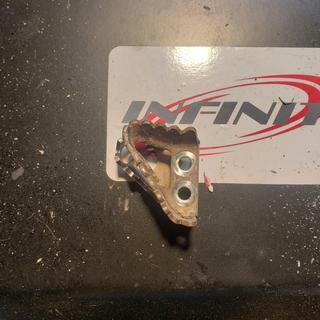 The part arrived quickly and was to install but, sadly, was exactly the same size as the brake pedal that Beta put on the bike at the factory. It seems higher quality than the original, but does not work for the reason I bought it. These stainless steel tips are the hot ticket very durable and can't beat the price. A little larger than stock, but performs perfectly with no issues. My stock (broken) broken one next to the new EE one for size comparison. My machine is a 2004 KTM 525EXC. EE has designed and built a terrific product that fits and works well over stock. The width dimension is +3mm wider than stock (35mm vs. 32mm) which works well, fit is perfect. 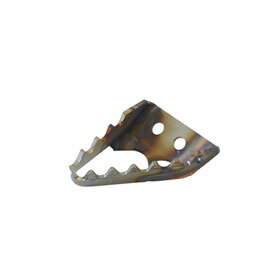 Finish is raw stainless, the boot face has larger and more aggressive teeth. Of note, being SS it can be wire-wheeled to a shiny finish if desired. Nice part. Quality. Sharper teeth, better grip! EE brake pedal tip 45 mm wide. Nice raw stainless finish matches my pegs!! Enduro engineering always makes great products at an awesome price. This fits that to the t. Looks great, bigger than stock and better looking than the factory blue. helped alot no sliding or missing brake petal with this tip. doesn't shred boot either. EE makes two widths on this tip: 35mm and 45mm. Which is this one? Thanks! BEST ANSWER: For the 2009 Husaberg it will be the same width as stock. The ones that are 35 or 45mm are for the 2016 or newer models. Thanks. My question pertains to which will be shipped; I've selected the tip for a 2017 Husky FX 350, which EE makes both sized tips for, but there's no option for me to select which of the two different models/lengths I want to order. Says it's part# 1682110001, but there's no indication of width. Any idea which would be sent out? Thanks again. I understand your issue, looks like RMATV is only stocking the 45mm at this time. If you would like the 35mm you are more than welcome to give them a call and special order part number 17-017. This should be a stock item for them soon. IM LOOKING TO BUY IT FOR A KTM 350 EXC-F 2018.. WILL IT BE LARGER/WIDER THAN STOCK? BEST ANSWER: It depends on what one is on your bike as standard. It is a little larger than stock and I wasn't too happy about it when it first arrived, but I've had ZERO issues with it over the last 9 months and I'm quite happy with it. Yes, the brake tip is maybe a half inch bigger all around than the stock tip. If i could include a picture in this response it would show the difference. Yes, the 17-016 is 15mm wider than your stock brake tip. I posted a pic in the reviews showing both. Is this tip any wider than stock? Yes it is. Not massively but it is definitely a firmer planting that you can feel on your toe. Plus it positions itself better because it has two sets of holes. Much better feedback from your pedal. Yes, it is probably a 1/2" wider but I find it works much better than stock for me. Thanks. And yes wider is better! Is the Enduro Engineering part number 17-016 or 17-015?